What are the seven sources you can use to create competitive advantage for your home care company in your local marketplace? What are the differences between marketing directly to consumers and marketing to referral sources? What marketing methods have proven to be most effective in marketing to consumers? Which marketing methods have proven to be most effective in marketing to referral sources? Every other month, we bring a very small group of home care company owners, CEOs, and COOs together in Louisville to discuss the answers to these questions and more in Private Duty Marketing Master Class. A Master Class is a unique learning opportunity for advanced learners who want to master a specific set of skills or knowledge. The Master Class is brand new to the home care industry, and the only place you can get his practical proven information in a way that you can implement in your company is here. If you are an advanced learner in home care, if you’ve been in the business for a while, and you are serious about developing new knowledge, skills, and attitudes to grow your business to the next level, then you’ll want to explore the Marketing Master Class. Data from the 2013 Private Duty Home Care Benchmarking Study from Home Care Pulse shows that the median sized company in our industry provides 1,000 hours of service per week, and bills out just over $1 million annually.Yet many companies reach a plateau about about $1.5 million – we call it the “Home Care Glass Ceiling” – and it’s very difficult to get past it if you get stuck there. 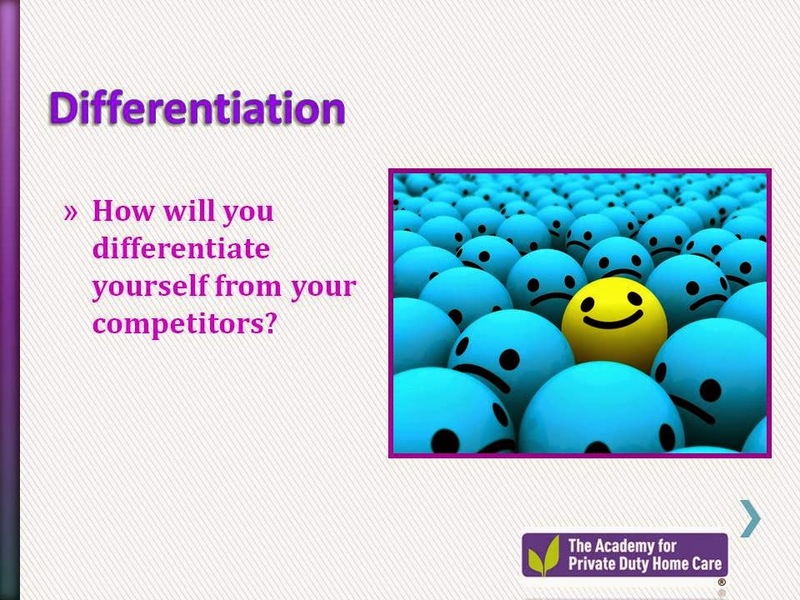 At Leading Home Care and The Academy for Private Duty Home Care®, we’ve been studying competitive strategy and marketing in home care for two decades. We’ve identified the seven ways you can separate your company from your competitors, and we’ve tracked the top ten marketing methods to reach referral sources. Join us in Louisville, Kentucky for our next Private Duty Marketing Master Class.